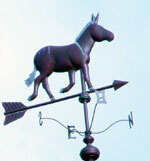 A weather vane made with hammered copper - a speciality of Villedieu les Poêles (50) - representative of Cotentin donkey overhangs Asinerie du Bocage. The visitors can not disturb this orphan foal, "Nougat du Bocage" which drinks with great appetite its ration of recombined milk. Cuddles, we have never enough! they will eat all the hay!!!" Do you want my photo?